Posted in Bundesliga, Bundesliga wrap up and tagged 1. FC Cologne, 1. FC Kaiserslautern, 1. FC Nürnberg, 1. FSV Maniz 05, Bayer Leverkusen, Borussia Dortmund, Borussia Mönchengladbach, Eintracht Frankfurt, FC Bayern Munich, FC St. Pauli, Hamburger SV, Hannover 96, SC Freiburg, Schalke 04, TSG 1899 Hoffenheim, VfB Stuttgart, VfL Wolfsburg, Werder Bremen. Bookmark the permalink. Posted in Bundesliga, Bundesliga wrap up and tagged 1. FC Cologne, 1. FC Kaiserslautern, 1. FC Nürnberg, 1. FSV Mainz, Bayer Leverkusen, Bayern Munich, Borussia Dortmund, Borussia Mönchengladbach, Eintracht Frankfurt, FC St. Pauli, Hamburger SV, Hannover 96, SC Freiburg, Schalke 04, TSG 1899 Hoffenheim, VfB Stuttgart, VfL Wolfsburg, Werder Bremen. Bookmark the permalink. Red Bull, the future of football? The name SSV Markranstädt was widely unknown until Red Bull purchased 49% of the team, renamed it RB Leipzig, and planned to conquer the Bundesliga with it in the next 8-10 years. Will this model be more widely used in the future? Football purist were, of course, up in arms about this purchase. Companies like Red Bull shouldn’t be able to use small local clubs and turn them into a soulless entity that solely exists to get consumers to buy more gummy-bear like tasting soft drinks. Even tho RB Leipzig aren't allowed to use Red Bull's name in their club name, their club logo leaves very little doubt about who the owner is. Posted in Advertising, Bundesliga, Bundesliga history, The future of football and tagged Bayer Leverkusen, Chemnitzer FC, Dietmar Hopp, Dietrich Mateschitz, Lokomotive Leipzig, New York Red Bulls, RB Leipzig, Red Bull, Red Bull Brasil, Red Bull Salzburg, Sachsen Leipzig, TSG 1899 Hoffenheim, VfL Wolfsburg. Bookmark the permalink. Posted in Bundesliga, Bundesliga wrap up and tagged 1. FC Cologne, 1. FC Kaiserslautern, 1. FC Nürnberg, 1. FSV Mainz, Bayer 04 Leverkusen, Borussia Dortmund, Borussia Mönchengladbach, Eintracht Frankfurt, FC Bayern Munich, FC St. Pauli, Hamburger SV, Hannover 96, SC Freiburg, Schalke 04, TSG 1899 Hoffenheim, VfB Stuttgart, VfL Wolfsburg, Werder Bremen. Bookmark the permalink. Posted in Bundesliga, Bundesliga wrap up and tagged 1. FC Cologne, 1. FC Kaiserslautern, 1. FC Nürnberg, 1. FSV Mainz, Bayer 04 Leverkusen, Borussia Dortmund, Borussia Mönchengladbach, Eintracht Frankfurt, FC Bayern Munich, FC Schalke 04, FC St. Pauli, Hamburger SV, Hannover 96, SC Freiburg, TSG 1899 Hoffenheim, VfB Stuttgart, VfL Wolfsburg, Werder Bremen. Bookmark the permalink. He has been called “Saddam” and “the torturer” by his players. Felix Magath is known for his brutal training sessions, but how has he managed to become one of the most successful coaches in the history of the Bundesliga? Felix Magath adresses Jefferson Farfan. arrived, and the massive amounts of snow that came from the sky made Germany look like a magical place that one otherwise only sees in commercials for CocaCola. But one Saturday afternoon nothing seemed to work. Christoph Metzelder and Benedikt Höwedes didn’t connect with keeper Manuel Neuer, Jermaine Jones passes were lackluster, Raul couldn’t bother to run. Kaiserslautern sent Schalke home with a whopping 5-0 defeat. Back in Gelsenkirchen “the torturer” knew how he should punish his players: nobody was allowed to wear gloves or snoots. Magath left no room for misunderstandings, he was mad as hell. Given the fact that Magath has won three German championships, and the DFB-cup twice, one is tempted to ask: is there anything else to this man? Magath himself has pointed out that mainly the tactical schooling of his players has made him win titles, not his physical toughness of his training sessions. Magath is famous for using medcine balls in his training sessions. Many former players have told German repoters that Magath's team loathes these balls. 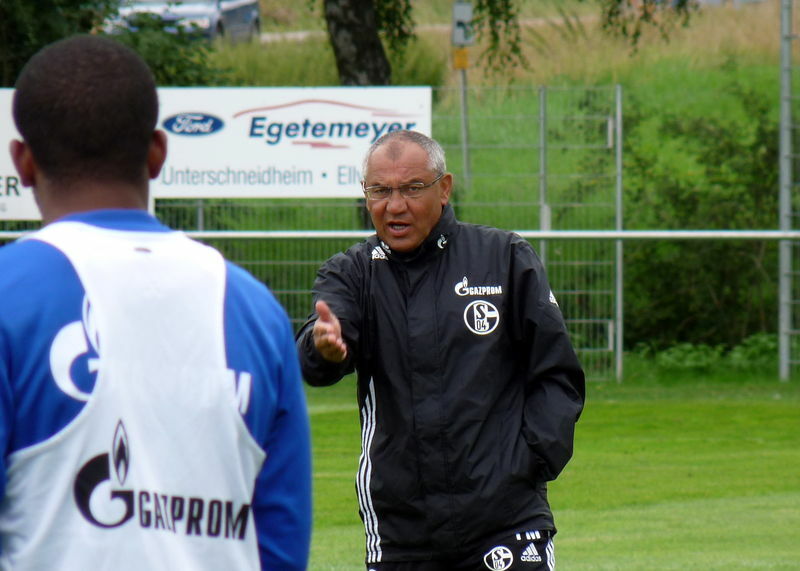 However, Magath’s physically demanding training style has had the effect that the teams he has coached in the past at one point became tired of Magath, and the former German international and Hamburg star was shown the door. Raphael Honigstein made the exact same point in the last Bundesliga podcast by Dan Levy and the Eurosport2 Bundesliga commentators. Honigstein told Levy that “many players told you off the record that they couldn’t have managed to be exposed to Magath’s training sessions for another year”. Former Schalke defender Rafinha told the tabloid paper Bild that Magath’s training sessions were so brutal, that he now felt qualified to become a general in the Brazilian army. I will finish my post by given another example of the brutality that Rafinha speaks about: Back in 2008, while being at Wolfsburg, Magath told a delighted group of players that the training for this afternoon had been canceled. The VfL had just finished another brutal training session in the training camp in Switzerland, and the players sat at their lunch tables. Magath told he delighted team that the players would be rewarded with coffee and cake at a cafe nearby with the provision that the players retain their training attire just in case. The players turned up in their training attire at the gondola that was supposed to take them up the mountain to the cafe. The mood was good. Magath managed to make their smiles disappear with one sentence: he told the group of young players they would get up the mountain by running the full 2362 meters. The players of the VfL Wolfsburg had to run for two and a half hours straight up the hill with Magath running right behind the team. Star striker Grafite collapsed before the end, and it is reported that a number of players broke down in tears as they reached the summit where they were finally able to enjoy their coffee and cake. Posted in Bundesliga, Bundesliga history, coaches, Schalke 04, VfL Wolfsburg and tagged Magath, punishment, Saddam, Schalke 04, torture, training sessions, VfL Wolfsburg. Bookmark the permalink.